There’s an unparalleled excitement we feel when we overcome obstacles in the wilderness. We feel a rush and deep satisfaction when we step into new territory, or try an activity for the first time, and expand our perception of our own abilities. Adventurers who thrive at that intersection of challenge and exploration should make their way to Colorado’s San Luis Valley, where they’ll find a handful of the toughest outdoor adventures in the Centennial State. 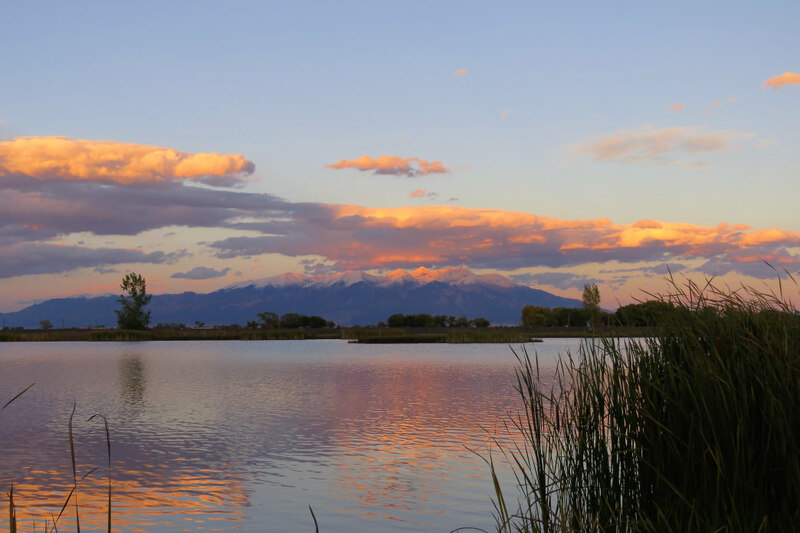 Alamosa sits in the center of the valley, with the Sangre de Cristo range to the east and the San Juan Mountains to the west. Denverites can blaze down I-25 and reach Alamosa in a four-hour drive. The area’s mix of spicy terrain is a draw for hikers, trail runners, mountain bikers, cyclists, and rock climbers. Here are a handful of the most riveting experiences for adrenaline-seekers in Southern Colorado. 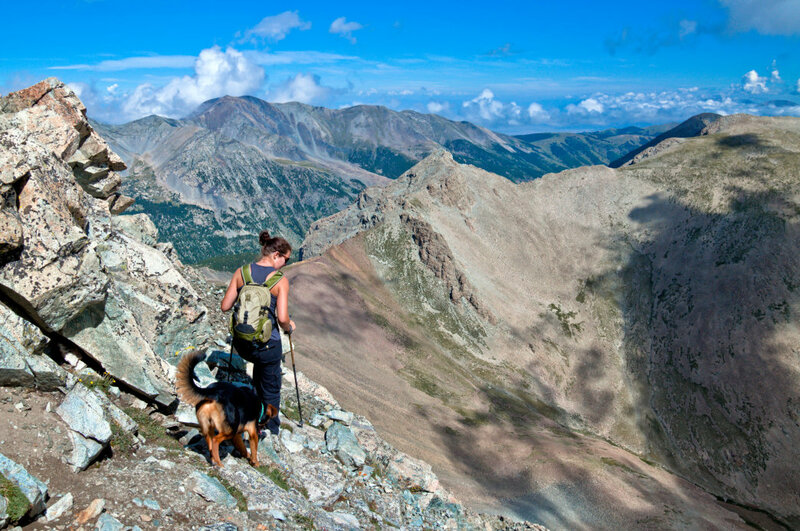 Alamosa is next door to one of the most rugged collections of 14,000-foot peaks in the state: the Sangre de Cristo Range. This segment holds one of the highest concentrations of technical climbing within Colorado’s Fourteeners and includes Crestone Peak, which some proclaim to be Colorado’s hardest fourteener. The options are plentiful. In total, the Sangre de Cristo Range has ten 14,000-foot peaks. As you plan your trip, consider the location of each cluster. Multiple peaks share the same trailhead or can be connected by a saddle. Peak baggers can increase the challenge by linking multiple peaks in a single day or a multi-day trip. Two clusters exist in the The Sangre de Cristos. The Crestone Group includes Crestone Peak, Crestone Needle, Humboldt Peak, Challenger Point, and Kit Carson. The Blanca Group encompasses Blanca Peak, Little Bear Peak, Ellingwood Point, and Mount Lindsey. One lone summit, Culebra Peak, is south of the aforementioned clumps. If you study guide books you’ll find close to 20 route variations for Crestone Peak alone. Study the options, and choose the route that best suits you, or hire a guide. Irwin Guides offers technical roped climbs of Crestone Peak and Crestone Needle. Weaving through the San Juan Mountains, Colorado state Highway 17 provides a great opportunity to challenge yourself with some high-elevation cycling. The road travels between Antonito, Colorado, and Chama, New Mexico, passing through beautiful sections of the Rio Grande National Forest as it follows the route of the coal-fired Cumbres and Toltec steam train. Many riders continue beyond La Manga Pass to also climb Cumbres Pass, which sits at an elevation of 10,022 feet. If you’re up for an even bigger challenge, you could ride all the way from Antonito to Chama, covering about 100 miles. Pro tip: Bike one-way and ride the coal-fired locomotive home the next day. The Cumbres and Toltec train travels between Antonito and Chama with daily departures from both towns. Be sure to book your train ticket in advance, and note that there’s a $10 bike storage fee, in addition to the regular cost of a train ticket. Penitente Canyon is an internationally-renowned haven for rock climbing. The canyon features more than 300 sport climbing routes, as well as bouldering, and a handful of trail options. If a project here doesn’t take your breath away, the stunning views of the Sangre de Cristo mountains will. Penitente’s bulbous boulders and formations are the aftermath of La Garita Caldera, a volcanic eruption that occurred 26 million years ago, which is said to be the largest explosive eruption in the world. The canyon deposit, known as “Fish Canyon Tuff,” is volcanic ash that is molded together. The result? An ideal solid surface with plenty of friction that’s perfect for climbers. The routes in the area range from 5.8 trad to 5.13+ sport. The majority of routes are 5.10 and above. One of the most popular classic climbs, Not My Cross to Bear (a 5.11a/b sport climb) ascends a corner dihedral up solid rock that’s superb for stemming. When you go, keep your eyes open for pictographs. 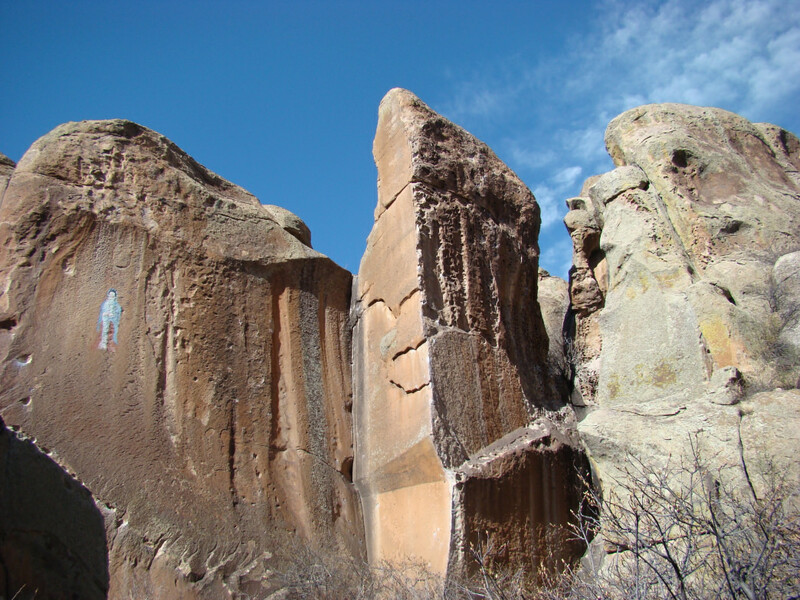 Panels were created by the tribes—either Pueblo, Apache, or Ute—that occupied the canyon prior to the Los Hermanos Penitente, a Spanish religious sect that used the canyon as a place of worship in the late 1800s. The ingredients for an excellent climbing trip all exist here. The south-facing routes can be climbed year-round, and in warmer months the temperatures stay cool. Plus, very little precipitation reaches the canyon. At the Penitente Canyon Campground there’s first come, first-served camping, and nearby there are two mountain bike loops, which are a great compliment for recovery days. Trail runners who are looking for a challenge can find it via higher elevation. Mt. Lindsey, one of the area’s fourteeners, has a runnable approach and is an awesome candidate for mountain running. The trail is 8.4 miles round-trip with 3,505 feet of ascent. The first portion of the trail is beneath forest and is friendly for fast footwork. The slope begins to steepen at about 11,000 feet and gets much slower at 13,000 feet. From there, runners can hike to the 14,042-foot summit or choose a Class 2 scramble. Bishop Rock Loop is a natural playground for mountain bikers. There is no designated singletrack: the forested area is a blank canvas, in which riders can choose their own adventure and work on their skills. Whether you’re dreaming of steep rock faces to roll, bermed walls to drop, bowls to whip around, or chasm gaps, all of the those features exist right here. Also, you can put in more miles at other nearby trails such as the Stone Quarry Tour (10.2 miles), 12 Hours of Penitence (17 miles), or Sunshine Kitty (8.1 miles). The area is remote and cell service is spotty, so it’s recommended that you ride with a group to provide an added element of safety.